Damages and spills of material / products can turn out to be dangerous and hazardous for the workers. This scenario can be avoided by using suitable handling equipment like Vacuum Packing Machine (Vertical Type). This equipment eases the labor's work and helps in preventing the drudgery of manual handling as well as other risk factors which contribute towards incurring unneeded costs. 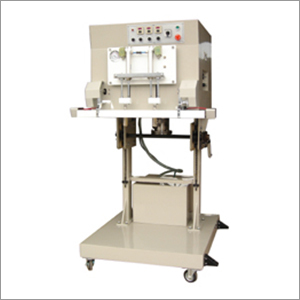 This Vertical Vacuum Packaging Machine adopts intelligent temperature controller, which can be adjusted as per the packing requirements. The overall rate of temperature error is less, whereas the packaging strength and gas exchange rates are higher. This machine is helpful in acquiring accurate results and decreasing the overall investment cost of your company.